There are lots of ways for a client to authenticate itself against a server, including basic authentication, form-based authentication, SSL authentication in RESTful web services, and OAuth. In these cases, the client communicates with the server over HTTPS, and the server’s identify is confirmed by validating its public certificate. The server doesn’t care who the client is, just as long as they have the correct credentials. An even higher level of security can be gained with using certificates for both the client and the server. “Two-way SSL” authentication (also known as “mutual authentication”, or “TLS/SSL with client certificates”) refers to two parties authenticating each other through verifying provided digital certificates, so that both parties are assured of the other’s identity. SnapLogic has multiple Snaps that support validating and authenticating SSL/TLS certificates, including SOAP, Splunk, and REST. 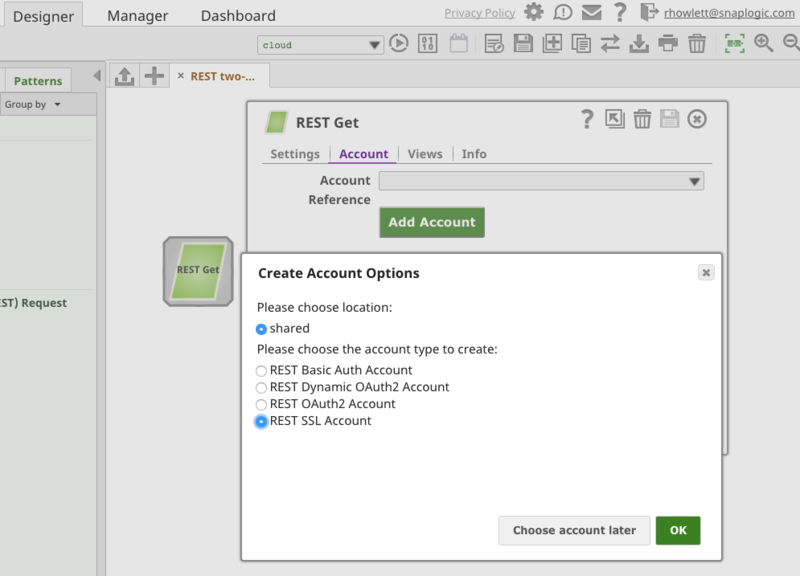 In this post, we will describe how to configure the REST Snap for “two-way SSL” authentication. SSL (Secure Sockets Layer) and TLS (Transport Layer Security) are protocols intended to ensure privacy between communicating applications and to transmit data safely. TLS is the successor to SSL (though, “SSL” continues to be colloquially used). Unless otherwise stated, in this document consider TLS and SSL as interchangeable. TLS/SSL is the standard security technology for establishing an encrypted link between a web server and a browser. HTTPS (Hypertext Transfer Protocol Secure) is the combination of SSL/TLS and HTTP to secure communications between the browser and a server. Most people are familiar with “one-way SSL”, where the browser (the client) establishes an SSL connection to a secure web site and the server’s certificate is checked (think of the “padlock” icons you have seen on your bank’s website, for example), creating SSL authentication in RESTful web services. The browser either relies on itself or the operating system providing a list of certs that have been designated as trusted Certificate Authorities (CA). To understand what values need to be entered, we need to talk about SSL with Java, and Java KeyStores (JKS). Java has its own version of PKCS12 called JKS. A JKS is like a database for certs and keys. It must be password protected and entries in it must have an “alias” that is unique. If an alias is not specified, “mykey” is used by default. For both the “KeyStore” and “TrustStore” fields in the REST SSL Account settings, we are going to use JKS files. The difference between them is for terminology reasons: KeyStores provide credentials, TrustStores verify credentials. The JDK ships with a tool called Keytool. It manages a JKS of cryptographic keys, X.509 certificate chains, and trusted certificates. Another excellent tool is OpenSSL, an open source toolkit implementing the SSL (v2/v3) and TLS (v1) protocols, as well as a full-strength general purpose cryptography library. 0000: 40 D2 BD 27 8E CC 24 83 30 A2 33 D7 FA 6C B3 F0 @..'..4.0.3..l..
0010: A4 2C 81 BA .,.. 0010: E5 DB 1F 1E ..?. 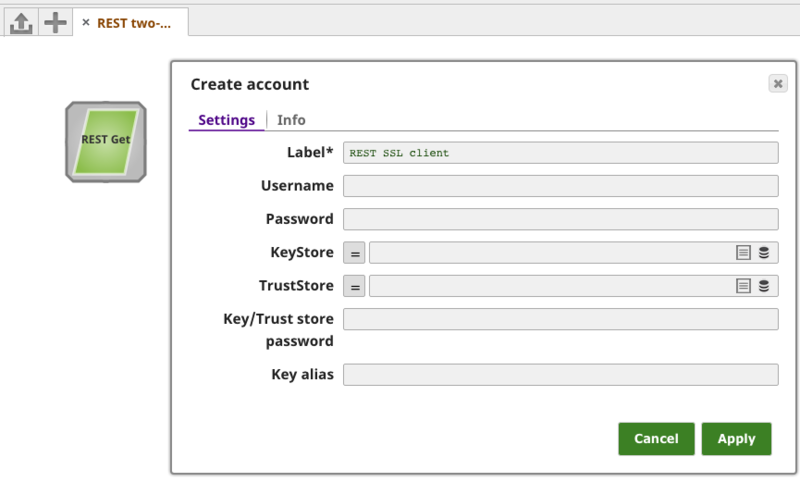 Finally, the client keystore stores the client certificate that will presented to the server for SSL authentication. Entry for alias client successfully imported. Robin Howett is a Senior Manager, Software Engineering at SnapLogic.